In music theory, the circle of fifths (or circle of fourths) is the relationship among the 12 tones of the chromatic scale, their corresponding key signatures, and the associated major and minor keys. More specifically, it is a geometrical representation of relationships among the 12 pitch classes of the chromatic scale in pitch class space. The term 'fifth' defines an interval or mathematical ratio which is the closest and most consonant non-octave interval. The circle of fifths is a sequence of pitches or key tonalities, represented as a circle, in which the next pitch (turning clockwise) is found seven semitones higher than the last. Musicians and composers use the circle of fifths to understand and describe the musical relationships among some selection of those pitches. The circle's design is helpful in composing and harmonizing melodies, building chords, and modulating to different keys within a composition. At the top of the circle, the key of C Major has no sharps or flats. Starting from the apex and proceeding clockwise by ascending fifths, the key of G has one sharp, the key of D has 2 sharps, and so on. Similarly, proceeding counterclockwise from the apex by descending fifths, the key of F has one flat, the key of B♭ has 2 flats, and so on. At the bottom of the circle, the sharp and flat keys overlap, showing pairs of enharmonically equivalent key signatures. Pitches within the chromatic scale are related not only by the number of semitones between them within the chromatic scale, but also related harmonically within the circle of fifths. Moving counterclockwise the direction of the circle of fifths gives the circle of fourths. 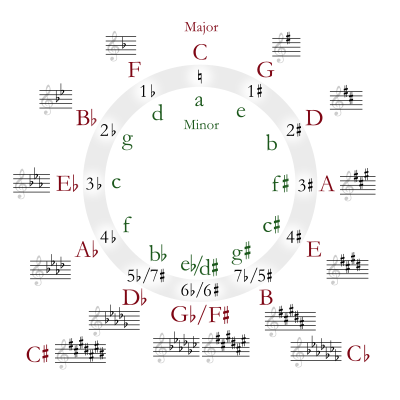 Typically the "circle of fifths" is used in the analysis of classical music, whereas the "circle of fourths" is used in the analysis of jazz music, but this distinction is not exclusive. The "circle of fifths" is a requirement in the barbershop style as the Barbershop Harmony Society's Contest and Judging Handbook says the barbershop style consists of "seventh chords that often resolve around the circle of fifths, while also making use of other resolutions", among other requirements. The circle is commonly used to represent the relationship between diatonic scales. Here, the letters on the circle are taken to represent the major scale with that note as tonic. The numbers on the inside of the circle show how many sharps or flats the key signature for this scale has. Thus a major scale built on A has 3 sharps in its key signature. The major scale built on F has 1 flat. For minor scales, rotate the letters counter-clockwise by 3, so that, e.g., A minor has 0 sharps or flats and E minor has 1 sharp. (See relative key for details.) A way to describe this phenomenon is that, for any major key [e.g. G major, with one sharp (F#) in its diatonic scale], a scale can be built beginning on the sixth (VI) degree (relative minor key, in this case, E) containing the same notes, but from E–E as opposed to G–G. Or, G-major scale (G–A–B–C–D–E–F#–G) is enharmonic (harmonically equivalent) to the e-minor scale (E–F#–G–A–B–C–D–E). Tonal music often modulates by moving between adjacent scales on the circle of fifths. This is because diatonic scales contain seven pitch classes that are contiguous on the circle of fifths. It follows that diatonic scales a perfect fifth apart share six of their seven notes. Furthermore, the notes not held in common differ by only a semitone. Thus modulation by perfect fifth can be accomplished in an exceptionally smooth fashion. For example, to move from the C major scale F–C–G–D–A–E–B to the G major scale C–G–D–A–E–B–F♯, one need only move the C major scale's "F" to "F♯". The circle can be easily used to find out the common chord progression for basic keys. The circle of fifths shows every major key with its corresponding minor key (of the Aeolian mode). This can be used as the vi chord in a progression. The V and IV chord can be found by moving clockwise and counterclockwise from the root chord respectively. The corresponding minor keys of the V and IV are the iii and ii respectively. In Western tonal music, one also finds chord progressions between chords whose roots are related by perfect fifth. For instance, root progressions such as D–G–C are common. For this reason, the circle of fifths can often be used to represent "harmonic distance" between chords. According to theorists including Goldman, harmonic function (the use, role, and relation of chords in harmony), including "functional succession", may be "explained by the circle of fifths (in which, therefore, scale degree II is closer to the dominant than scale degree IV)". In this view the tonic is considered the end of the line towards which a chord progression derived from the circle of fifths progresses. Play subdominant, supertonic seventh, and supertonic chords (help·info) illustrating the similarity between them. Goldman argues that "historically the use of the IV chord in harmonic design, and especially in cadences, exhibits some curious features. By and large, one can say that the use of IV in final cadences becomes more common in the nineteenth century than it was in the eighteenth, but that it may also be understood as a substitute for the ii chord when it precedes V. It may also be quite logically construed as an incomplete ii7 chord (lacking root)." The delayed acceptance of the IV–I in final cadences is explained aesthetically by its lack of closure, caused by its position in the circle of fifths. The earlier use of IV–V–I is explained by proposing a relation between IV and ii, allowing IV to substitute for or serve as ii. However, Nattiez calls this latter argument "a narrow escape: only the theory of a ii chord without a root allows Goldman to maintain that the circle of fifths is completely valid from Bach to Wagner", or the entire common practice period. When an instrument is tuned with the equal temperament system, the width of the fifths is such that the circle "closes". This means that ascending by twelve fifths from any pitch, one returns to a tone exactly in the same pitch class as the initial tone, and exactly seven octaves above it. To obtain such a perfect circle closure, the fifth is slightly flattened with respect to its just intonation (3:2 interval ratio). Thus, ascending by justly tuned fifths fails to close the circle by an excess of approximately 23.46 cents, roughly a quarter of a semitone, an interval known as the Pythagorean comma. In Pythagorean tuning, this problem is solved by markedly shortening the width of one of the twelve fifths, which makes it severely dissonant. This anomalous fifth is called wolf fifth as a humorous metaphor of the unpleasant sound of the note (like a wolf trying to howl an off-pitch note). The quarter-comma meantone tuning system uses eleven fifths slightly narrower than the equally tempered fifth, and requires a much wider and even more dissonant wolf fifth to close the circle. More complex tuning systems based on just intonation, such as 5-limit tuning, use at most eight justly tuned fifths and at least three non-just fifths (some slightly narrower, and some slightly wider than the just fifth) to close the circle. Other tuning systems use up to 53 tones (the original 12 tones and 42 more between them) in order to close the circle of fifths. A simple way to see the musical interval known as a fifth is by looking at a piano keyboard, and, starting at any key, counting seven keys to the right (both black and white, not including the first) to get to the next note on the circle shown above. Seven half steps, the distance from the 1st to the 8th key on a piano is a "perfect fifth", called 'perfect' because it is neither major nor minor, but applies to both major and minor scales and chords, and a 'fifth' because, although it is a distance of seven semitones on a keyboard, it spans five adjacent notes in the major or minor scale. A simple way to hear the relationship between these notes is by playing them on a piano keyboard. When traversing the circle of fifths backwards, the notes will feel as though they fall into each other[clarification needed]. This aural relationship is what the mathematics describe. Perfect fifths may be justly tuned or tempered. Two notes whose frequencies differ by a ratio of 3:2 make the interval known as a justly tuned perfect fifth. Cascading twelve such fifths does not return to the original pitch class after going round the circle, so the 3:2 ratio may be slightly detuned, or tempered. Temperament allows perfect fifths to cycle, and allows pieces to be transposed, or played in any key on a piano or other fixed-pitch instrument without distorting their harmony. The primary tuning system used for Western (especially keyboard and fretted) instruments today, twelve-tone equal temperament, uses an irrational multiplier, 21/12, to calculate the frequency difference of a semitone. An equal-tempered fifth, at a frequency ratio of 27/12:1 (or about 1.498307077:1) is approximately two cents narrower than a justly tuned fifth at a ratio of 3:2. In musical pieces from the Baroque music era and the Classical era of music and in Western popular music, traditional music and folk music, when pieces or songs modulate to a new key, these modulations are often associated with the circle of fifths. Handel, aria "Pena tiranna" from Amadigi. Orchestral introduction. Robert Schumann’s evocative “Child falling asleep” from his Kinderszenen springs a surprise at the end of the progression: the piece ends on an A minor chord, instead of the expected tonic E minor. The enduring popularity of the circle of fifths as both a form-building device and as an expressive musical trope is evident in the number of "standard" popular songs composed during the twentieth century. It is also favored as a vehicle for improvisation by jazz musicians. Ray Noble “Cherokee.” Many jazz musicians have found this particularly challenging as the middle eight progresses so rapidly through the circle, "creating a series of II–V–I progressions that temporarily pass through several tonalities." Kosmo, Prevert and Mercer "Autumn Leaves"
The Beatles, "You never give me your money"
The diatonic circle of fifths is the circle of fifths encompassing only members of the diatonic scale. Therefore, it contains a diminished fifth, in C major between B and F. See structure implies multiplicity. The circle progression is commonly a circle of fifths through the diatonic chords, including one diminished chord. A circle progression in C major with chords I–IV–viio–iii–vi–ii–V–I is shown below. The circle of fifths is closely related to the chromatic circle, which also arranges the twelve equal-tempered pitch classes in a circular ordering. A key difference between the two circles is that the chromatic circle can be understood as a continuous space where every point on the circle corresponds to a conceivable pitch class, and every conceivable pitch class corresponds to a point on the circle. By contrast, the circle of fifths is fundamentally a discrete structure, and there is no obvious way to assign pitch classes to each of its points. In this sense, the two circles are mathematically quite different. has four generators, which can be identified with the ascending and descending semitones and the ascending and descending perfect fifths. The semitonal generator gives rise to the chromatic circle while the perfect fifth gives rise to the circle of fifths. The circle of fifths drawn within the chromatic circle as a star dodecagram. The circle of fifths, or fourths, may be mapped from the chromatic scale by multiplication, and vice versa. To map between the circle of fifths and the chromatic scale (in integer notation) multiply by 7 (M7), and for the circle of fourths multiply by 5 (P5). (C, G, D, A, E, B, G♭, D♭, A♭, E♭, B♭, F). The key signatures found on the bottom of the circle of fifths diagram, such as D♭ Major, are often written one way in flats and in another way using sharps. These keys are easily interchanged using enharmonic equivalents. Enharmonic means that the notes sound the same, but are written differently. For example, the key signature of D♭ Major, with five flats, contains the same sounding notes, enharmonically, as C♯ Major (seven sharps). ^ Michael Pilhofer and Holly Day (23 Feb., 2009). "The Circle of Fifths: A Brief History", www.dummies.com. ^ Nattiez 1990, p. 225. ^ a b Goldman 1965, p. 68. ^ Goldman 1965, chapter 3. ^ a b Nattiez 1990, p. 226. ^ Jensen 1992, pp. 306–307. ^ Whittall, A. (2002, p. 259) “Circle of Fifths”, article in Latham, E. (ed.) The Oxford Companion to Music. Oxford University Press. ^ Taruskin, R. (2010, p. 184) The Oxford History of Western Music: Music in the Seventeenth and Eighteenth centuries. Oxford University Press. ^ Taruskin, R. (2010, p. 188) The Oxford History of Western Music: Music in the Seventeenth and Eighteenth centuries. Oxford University Press. ^ Scruton, R. (2016, p. 121) The Ring of Truth: The Wisdom of Wagner’s Ring of the Nibelung. London, Allen Lane. ^ Scott, Richard J. (2003, p. 123) Chord Progressions for Songwriters. Bloomington Indiana, Writers Club Press. ^ McCartin 1998, p. 364. Goldman, Richard Franko (1965). Harmony in Western Music. New York: W. W. Norton. Jensen, Claudia R. (1992). 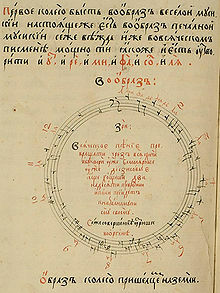 "A Theoretical Work of Late Seventeenth-Century Muscovy: Nikolai Diletskii's "Grammatika" and the Earliest Circle of Fifths". Journal of the American Musicological Society. 45 (2 (Summer)): 305–331. JSTOR 831450. McCartin, Brian J. (1998). "Prelude to Musical Geometry". The College Mathematics Journal. 29 (5 (November)): 354–370. JSTOR 2687250. Archived from the original on 2008-05-17. Retrieved 2008-07-29. Nattiez, Jean-Jacques (1990). Music and Discourse: Toward a Semiology of Music, translated by Carolyn Abbate. Princeton, NJ: Princeton University Press. ISBN 0-691-02714-5. (Originally published in French, as Musicologie générale et sémiologie. Paris: C. Bourgois, 1987. ISBN 2-267-00500-X). D'Indy, Vincent (1903). Cours de composition musicale. Paris: A. Durand et fils. Lester, Joel. Between Modes and Keys: German Theory, 1592–1802. 1990. Miller, Michael. The Complete Idiot's Guide to Music Theory, 2nd ed. [Indianapolis, IN]: Alpha, 2005. ISBN 1-59257-437-8. Purwins, Hendrik (2005). "Profiles of Pitch Classes: Circularity of Relative Pitch and Key—Experiments, Models, Computational Music Analysis, and Perspectives". Ph.D. Thesis. Berlin: Technische Universität Berlin. Purwins, Hendrik, Benjamin Blankertz, and Klaus Obermayer (2007). "Toroidal Models in Tonal Theory and Pitch-Class Analysis". in: Computing in Musicology 15 ("Tonal Theory for the Digital Age"): 73–98.